Horizontal Directional Drilling (or simply HDD) is a trenchless technology that allows the installation of underground pipes and cable without open trench excavation. The combination of a steerable drilling tools and guidance systems allows an active control of the drilling path. 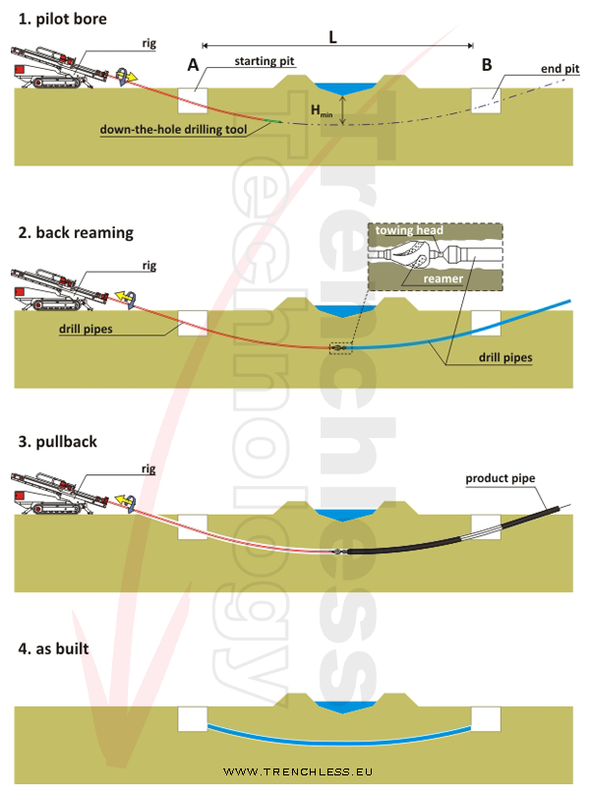 It results in the possibility to guide the drilling string through the soil, following a preassigned drilling path. During the pilot bore stage, a guided borehole is drilled through the soil along the preassigned drilling path. Once the pilot bore has been drilled, one or more reaming passages are carried out in order to enlarge the diameter of the borehole. After the final reaming stage, the pipe or cable is pulled back into the enlarged borehole from the end point to the start point. The crossing of rivers, roads, woods or sea lagoons, or simply the installation of pipes or cables along roads or in busy urban areas are possible by using HDD. steel, HDPE, PVC, PP and cast iron; cables.